Hello there lovelies, today I am sharing with you all another altered frame. I am having so much fun with these frames that I decided to create a Halloween themed frame and even better that the colours are similar to the Dusty Attic mood board. For the frame I used Micro Bricks 6×6 stencil by The Crafter’s Workshop with texture paste and then painted the frame using black gesso. Once it was dry I used some Lindy’s Stamp Gang sprays and Prima Art Alchemy Waxed to highlight the bricks. I stamped onto the glass with a Tim Holtz stamp and stazon ink, then used Dylusions Spray Tangerine Dream. For the haunted house I used black gesso, clear crackle varnish and a Lindy’s Stamp Gang Spray – Silent Night Silver. For the windows I painted some scrap pieces of chipboard using Prima Sparks paint in Dragons Eye. The dead tree and crooked fence is a combination of Distress Inks in the brown tones. For all the other chipboard I used black gesso with a combination of Art Alchemy Waxes, Art Alchemy Acrylic Paints and Prima Sparks Paints. I wanted to add some more texture to the frame so I bought some Autumn moss from my local Spotlight store and used strong liquid adhesive to adhere to the glass and then adhered all my chipboard pieces layer by layer. I hope I have inspired you to create a Halloween theme project using your awesome Dusty Attic products. Remember that there is a spooky 20% all Halloween products on the Dusty Attic Website so be sure to get your order in!!! Hey Hey my mixed media followers!!! Today I am up on the Dusty Attic blog with this mixed media altered frame. I created this frame to demo at the Dusty Attic Retreat last month and I had so much fun creating it. 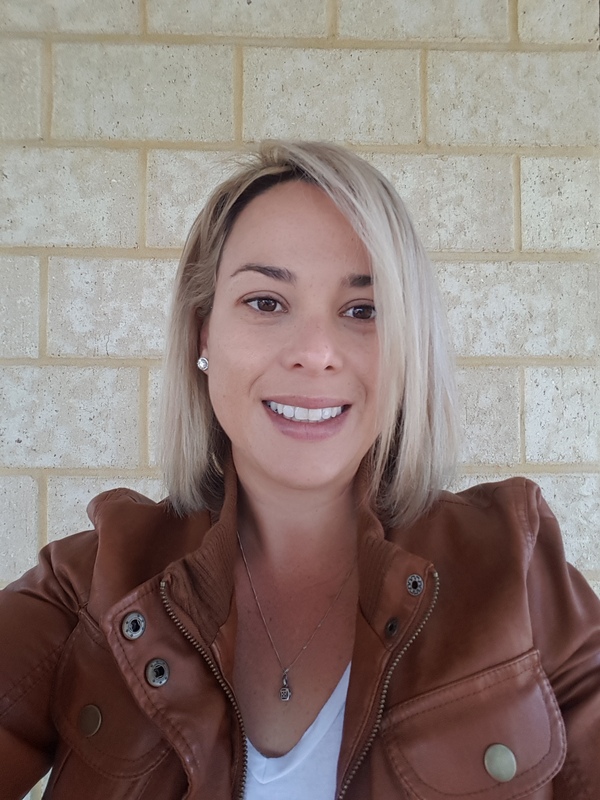 I have had such an overwhelming response to the frame that I am teaching it here in Perth next month and also at another retreat in October in NSW so I won’t be able to giveaway too many details. The frame I used is a shadow box photo frame and I used Dusty Attic Texture Paste along with Prima Rust Effect Paste and some Prima Sprays. The centre of the frame I used some chipboard pieces, Jumbo Cogs, Monarch Butterflies, Mini Number Grid, embossing powder, Dusty Attic Rusting Powder and some inks. I added some Dusty Attic Pearls, Tim Holtz Stickers and also added some stamping to the chipboard pieces. Hello Everyone, it’s my turn on the The Crafter’s Workshop blog today with another mixed media art journal page. Here in Australia winter has arrived and I thought I would create a layout that was inspired by “Coffee”- which I am sure most of you would agree is essential for a cold winters day. To start my pages I painted TCW9002 Black Gesso with a paint brush over both pages and dried with my heat tool. Now to build my background…. I mixed TCW9023 Blue Jellybean and TCW9016 Spun Sugar Heavy Body Acrylic Paint together and then used a brayer to apply to both my pages. I mixed TCW9016 Spun Sugar and TCW9020 Raspberry Sorbet Heavy Body Acrylic Paint together and using the brayer again applied to my pages. Once I was finished with the colours I then mixed a small amount of water with TCW9016 Spun Sugar Heavy Body Acrylic Paint and using a small paint brush, I splattered all over the pages. I realized afterwards I may have gotten a little carried away with the paint so now I am using a baby wipe with TCW9002 Black Gesso and just dabbing around the edges. Now for my stencil and I absolutely love this one! I used 6×6 TCW796 Fresh Coffee and stenciled “Fresh Brewed” for the top of my art journal page and “COFFEE” for the bottom of the page. I used a make up sponge and TCW9016 Spun Sugar Heavy Body Acrylic Paint. Next I stamped my coffee images using Tim Holtz stamp set Fresh Brewed Blueprint onto some white card and then used Distress Crayons to colour them. I used one of the stars from TCW796 Fresh Coffee and my Distress Crayon to add to my ice coffee image. To finish the pages I adhere all my coffee images using a liquid adhesive. I also added some shading using Black Soot Distress Crayon around the coffee cups. Hi fellow crafters! Today I am up on the Helmar Creative blog with this art journal page. Next I sprayed Dylusions Ink Spray Slate Grey onto my The Crafter’s Workshop stencil, TCW427s Mini Quartrefoil Revd. Once the sprays were dry, I then stamped randomly onto my page using Dyan Reavely’s Basically Square stamp and stencil set and black archival ink. I also used my Dylusions Acrylic Block around the edges and created the white dots with a white Uni Posca paint pen. The next step was to stamp some images onto some white cardstock. I used the following Dylusions stamp sets – Passage of Time, How About Never and Flight of Fancy. Then I used some alcohol markers I bought from my local Aldi store to colour in my images. 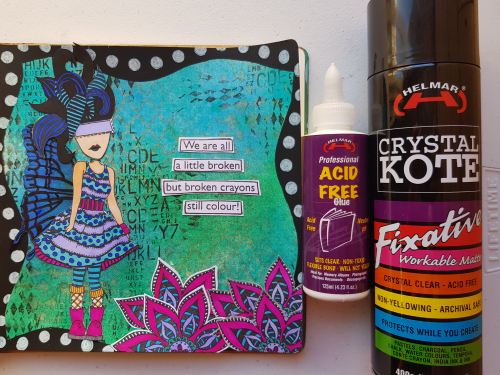 After fussy cutting my stamped images I then used Helmar Professional Acid Free Glue to adhere all my pieces to the art journal page. This is my “go to” adhesive as I find it is strong and quick drying. Then to finish off the page I sprayed a coat of Helmar Crystal Kote Fixative spray. Before receiving my design team kit, I had never actually heard of this spray but oh my gosh do I love it!!!! If you are like me and love using different mediums in your art journal pages, sometimes you will find that your mediums will make your pages stick together. I was previously using a wax but it wasn’t really doing anything and I found I kept tearing my pages apart. Please do yourself a favour and get this Fixative spray. It not only seals your page so you can add more mediums over the top without ruining your hard work underneath but it also stops the pages from sticking together…. it is just amazing!! !